All born to be loved, love to feel special and if it is on some special day? Yes, it is about Valentine’s Day. 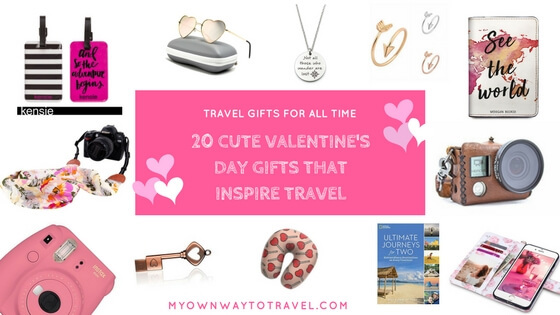 This time I’m loving to list 20 cute Valentine’s Day gifts that inspire travel. Here some of them are my favorite travel-related items which I more often use. And some will love to present and get as gifts. Being a solo traveler, I’m also thinking to present myself something special. The listed Valentine’s gifts are also completely alright to buy and present any of your suitable or special day. Yes, travel gifts for all time. Exactly travel itself is a special gift you can present yourself. We travelers more often present that gift by exploring many new destinations every year. At the same time, it’s a pleasure to buy and carry stylish travel accessories or travel resources. I enjoy it on any trip. How about you? So here you go! Check below some budget-friendly gift ideas to inspire travel lovers family and friends, your wanderlust valentine, and wanderers around. You might also like to get more Valentine’s Day gift ideas from my Amazon Page Idea Lists. 3 Are You On Pinterest? Click To Save To Your Pinterest Board! Are you a frequent traveler, how about your partner? You’ll definitely love to keep and gift Personalized RFID Blocking Leather Passport Cover Wallet – See The World handmade by leather. 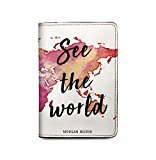 You can personalize this cover and perfectly designed to fit the common passport size for many countries. Let start the adventure begins. Cute Luggage Buckle Closure Tag is the stylish match for your travel luggage. You can use this tag in any type of luggage from stylish backpacks to carry-on bags. It covered with plastic PVC, durable and you don’t have to take out during checking hour at the airport. You’re right I’m a bit possessive about smart gadgets and accessories. And I can’t imagine to start my day and travel anywhere without my MacBook. I believe you too! So, this particular travel gear deserves always more love. Plemo Water-resistant PU Leather Sleeve for 13-13.3 Inch MacBook or iPad can be the perfect travel gift to present. The stylish and slim laptop case is fit for most popular brands of laptops and notebooks. 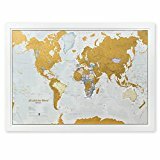 Scratch Off World Map Poster truly inspire travel. 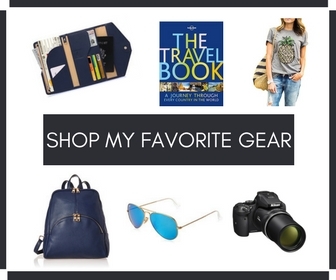 Just a perfect travel gift for travelers and travel lovers. The best way to remind the places you already visited. You can hang this map on the wall and scratch off every destination you wish to visit in the future. Your traveler friends will definitely love to show off their memory related travels through this world map. It’s the time to send more love to your stylish globetrotting valentine on this Valentine’s Day. You might like to gift something unique. How about this eco-friendly Handmade Bamboo Handbag for your love? Just a perfect and cute travel tote for girl travelers to enjoy a beach holiday. The weight of this clutch bag is light, easy to carry and hold a cell phone and small travel items. 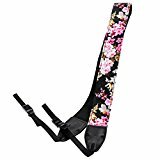 Don’t miss to present your valentine this Universal Camera Neck Belt Strap who loves travel photography. The beautiful and stylish camera scarf belt strap fit for almost all types of DSLR and SLR cameras. If you’re a couple traveler obviously thinking to surprise your partner. Yes, why not make a special trip with your valentine on this special day? Before booking your romantic trip you might like to read some travel books Ultimate Journeys for Two, written by Mike and Anne Howard. This romantic travel couples shared their adorable travel experiences. This book truly inspires to travel. Destinations of a Lifetime: 225 of the World’s Most Amazing Places by National Geographic is another inspirational travel read for all time and perfect for all travelers. Seriously I need either this device or GoPro Hero 7 on this month of February. I captured my own photos. I took a lot of selfies and enjoy recording videos as well. Are you a solo traveler like me? Then count this Fujifilm Selfie Mirror Camera to buy and carry during your trip around. As a gadget lover, definitely worth to buy to hold your awesome travel moments. 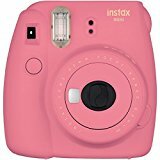 Do your partner love to take selfies, then don’t think twice to surprise her with this cute Flamingo Pink on Valentine’s Day? 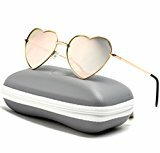 Women love to travel in style and if interested to inspire your beach lover friend then get this Heartshape Sunglasses. And also perfect to admit your love for her through this stylish and cute sunglasses. The best part about this smart accessory is that it will protect your eyes from harmful ultraviolet rays. GoPro became a part of these days’ adventure lovers around. How about giving a bit more love to your GoPro device this special day? This Handmade Leather Case for GoPro HERO 5 HERO 6 Hero 7 is just a perfect match for your GoPro Camera. I’m loving the antique touch of this case. Having GoPro HERO 4 Silver? No worries, Handmade Leather Case for GoPro HERO 4 Silver is also available to buy. Universal Travel Adapter can be a perfect travel gift as a must-have carry-on essentials to present your travelholic friend or partner. He/she will love to carry this power adapter which supports more than 150 countries and also inspire travel. To comfort your long journey headphone is another carry-on essential while traveling. 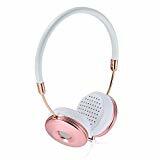 The stylish Rose Gold On-Ear Headphones can be your best gift choice to present your girlfriend who loves music as well. You can fold this headphone. And also possible to answer your phone calls without accessing your phone (Supports iPhone and Samsung). Happiness is to get a cute gift for any special occasion, right? I know you already got one/many memory sticks. 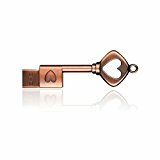 But this Metal Heart Key Shaped Flash Drive is so cute as a gift for your techy valentine. This portable device is secure and made of top quality metal. I love to carry at least one flash drive while traveling, just a part of carry-on essential. I love to give much importance to personal care as well. Even you’re traveling often you shouldn’t be careless on the road. 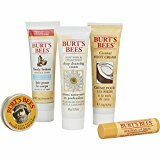 Burt’s Bees Essential Everyday Beauty Gift Set is best to present your travel partner. This travel size gift set packed with Milk and Honey body lotion, hand and feet cream, lip balm, deep cleansing cream. At least don’t forget to pamper yourself on this special day. 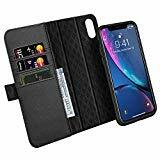 iPhone XR Detachable Wallet Case can be used to keep your iPhone as well as cash, credit cards while traveling. 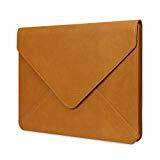 The stylish genuine leather case got RFID blocking kickstand feature card slots and is a perfect Valentine’s Day gift box to present your travel girl or girlfriend. 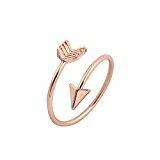 The inspirational Arrow Travel Ring is a perfect Valentine’s gift to present your wanderlust female friend who intensely loves to travel. You will love to wear as a toe or knuckle ring. Sometimes stylish accessories help to boost your confidence. Do you feel the same? 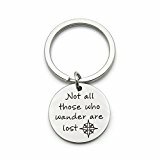 Definitely not all lost who wander and this Inspirational Pendant Keychain to keep up this spirit. Many near of you want to travel to inspire and encourage them present this cute pendant which is perfect for any special day. To inspire all travel lovers and especially backpackers around Traveling Travel Mug is the best to gift on this special day. Are you backpacking but still single? It is alright, no harm to treat yourself alone the best way even on this Valentine’s Day. This Travel Mug will keep your drinks hot and cold for a longer time. 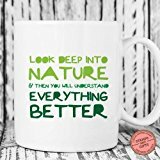 Any motivational quotes always motivate me; as a nature lover, I’d love to keep this motivational mug for myself as well. Motivational Handmade Ceramic Mug is also best to gift any special day. Would you prefer to celebrate Valentine’s Day in a traditional way? The stylish and luxurious Old Moscow Copper Beer Mugs can be the perfect gift choice for your man or wanderer boyfriend. Even best to present your family to celebrate the moment together by serving beer at home. Alright, you’re an adventurous soul and single but still, Valentine’s Day can be for you too. It is all about the way you like or want. Moreover, never stop loving you and exercise to spread the love for everyone. UPDATE: On Jan 08, 2019 got one GoPro HERO 7 Silver as a travel gift and it was a present to myself. There is a contradictory like love is not just for one day, love is for every day. Yes, right but there is nothing wrong to love a bit more on this special Valentine’s Day. I wish you all enjoy this special day in your way. Book a trip with your family, fellow travelers or friends. Even enjoy going solo or from your home. Inspire your family, friends to travel with any of the inspirational gift ideas above. Furthermore, let me know if you’re presenting me something as well, lol! Are You On Pinterest? Click To Save To Your Pinterest Board! What are you planning for this year Valentine’s Day? 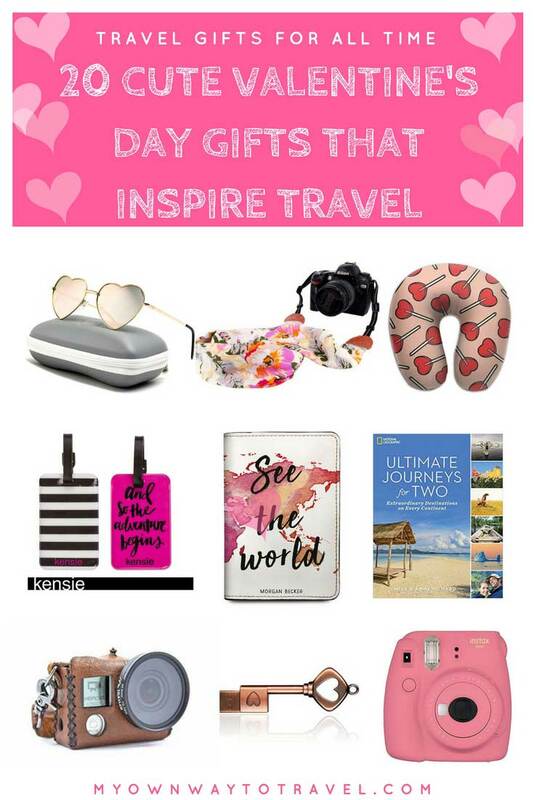 Any recommended Valentine’s Day gifts that inspire travel? Leave your thoughts in comments! Hey Christine, that’s too romantic idea, hahaha. I just wish him to pick one to surprise you 🙂 My lots of love to you both! I’m in need of a new iPhone case, so I’m definitely leaning towards the wallet case. Good to know that you can put cash and credit cards as well. Sounds very useful indeed.. AND that waterproof case for MacBook. I often bring mine when I travel (especially when I know that I need to blog. LOL), but just put it in my bag.. This is more reliable though. 🙂 Will be showing this post to my husband now. haha. Thank you for the cool ideas! ah I love these so much! Especially the waterproof laptop case! I didn’t even know that existed! Wow those copper mugs are beautiful!!!! I’d gift that to myself. LOL! I love to have Scarf Camera Neck Shoulder Strap Belt for Nikon and waterproof case for MacBook. Great gift idea list. There are some seriously cute gifts here. I especially like the flower scarf camera strap. That looks so much more gentle for a sunburn!!! Great list! I love those rose gold headphones.